For 30 years, Christine Gibson ordered a cab from Central Taxis every Saturday morning to take her for her hair appointment, always tipping her driver with a pound and a chocolate from her purse. Gibson lives alone and has no surviving family, so when her 100th birthday rolled around, she assumed it would be spent on her own, without any fanfare or celebration. But drivers and staff at Central had other plans, laying out flowers, champagne, a cake and a tour of their HQ for their favorite customer. Instead of ordering a cab, Mrs Gibson even got to don a headset and dispatch some taxis herself. 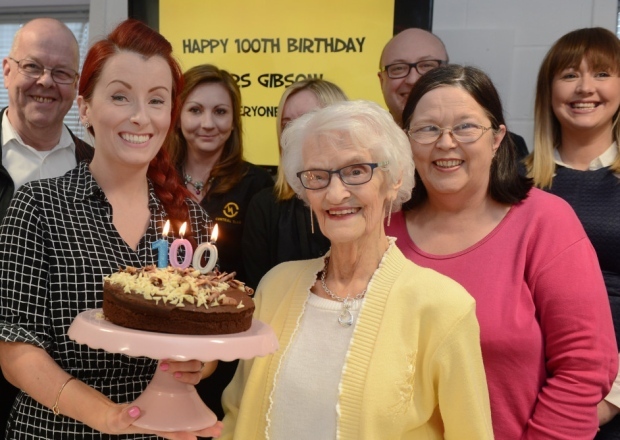 Central Taxis boss Tony Kenmuir said staff at the firm enjoyed the day as much as Mrs Gibson, who has lost none of her sharp wit despite her 100 years. I absolutely love it! 100 years young! What a great story and such an induration! But most importantly, what a wonderful kindness on the part of all those who took the time to make this very special day one she will never forget. It must have been cool listening to her on dispatch. Wow – she looks great for 100. It is so see someone with a good quality of life at that age.